Have you ever wondered what a cat’s meow sounds like in Japanese? How about the grumble of an empty stomach, the wail of a police car’s siren or the crash of an ocean wave? 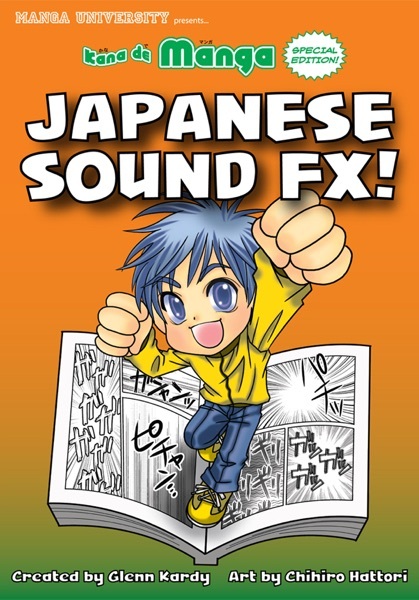 Japanese manga artists rely heavily upon onomatopoeia — sound-effect words — and this special entry in Manga University’s award-winning Kana de Manga / Kanji de Manga language-learning series is jam-packed with illustrated examples of those sounds (and more!) in action. Featuring more than 100 Japanese onomatopoeia and their English equivalents in categories such as “Humans,” “Animals,” “Machines” and “Nature.” Japanese/English text.